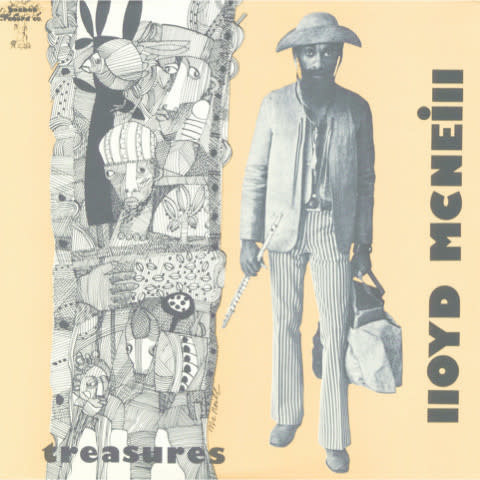 Soul Jazz Records release flautist Lloyd McNeill’s album Treasures (1976). Originally issued on the artists’ own private press Baobab label in New York, the album is a serious collectors’ piece, a heavyweight and fascinating fusion of deep and spiritual jazz sensibilities blended with Brazilian and Latin rhythms and melodies. Treasures was the culmination of this intense period for McNeill, fusing Brazilian, jazz and Latin sensibilities together. The album features McNeill on flute, Cecil McBee on bass, Dom Salvador on piano and three percussionists - the Brazilian multi- instrumentalist Portinho, Latin percussionist Ray Armando and jazz drummer Brian Brake.